The literature of the French middle ages boasts an abundance of poetic forms: lai, virelai, chant royal, dit, sirventès, jeu parti, aubade, congé, motet, ballade, chanson, plaint, pastourelle, trobar clus, trobar ric, trobar leu, rondeau, etc. However, the vehicale of themes like satire, narrative, amour courtois, celebration of faith and military victory frequently produced relatively small poems to which genre lables do not seem to apply. The poetric conventions of metric lines and rhymes or strong assonance are frequently used in very long works: romans, and chansons de geste. The needs of patrons and the practice of scriptoria do not leave us a tradition of anthologies which isolate by genre. For this, we do have the chansonniers. There are also smaller poems by author in manusripts focusing on Christine de Pizan, Alain Chartier, François Villon, Jehan Froissart, Guillaume de Machault . 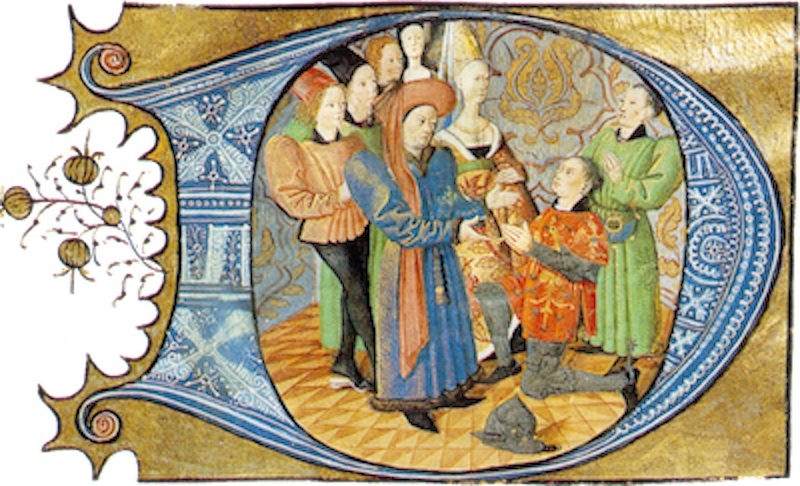 One link is to an enhanced copy of the personal manuscript of Charles d'Orléans, where many of the poets were guests in his castle, responded to each other, and played poetic games.